Baptist Juice | Community Health | Got the travel bug? Stay healthy on the road. Prepare for healthy travel during the hectic holidays. Let’s face it, it’s hard to feel like yourself when you’re sleeping in a hotel bed, riding in the back of cabs and eating out for every meal. From business trips to holiday travel, we’re always on the go. And it’s even harder to travel when you’re sick. 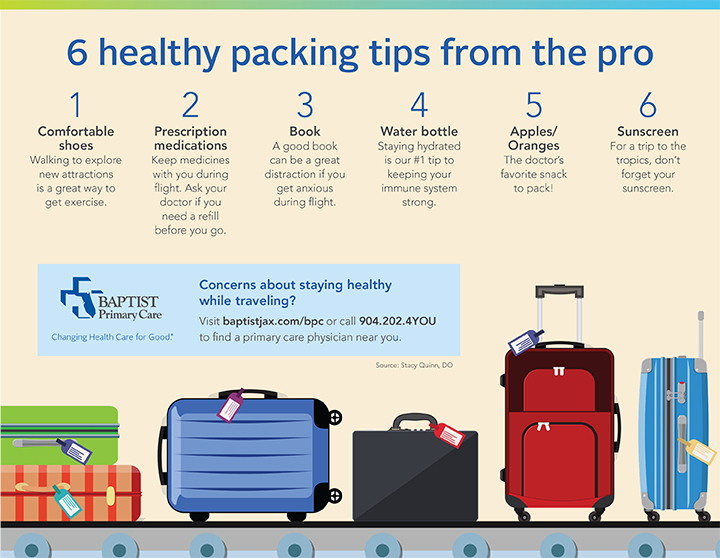 Tips from Stacy Quinn, DO, a family physician with Baptist Primary Care, has tips for every situation to help you stay healthy while traveling. Sunscreen. Dermatologists recommend wearing sunscreen daily no matter the season, but it’s an essential item to pack for a trip to the tropics. Insect repellant. This is a very important tool for avoiding insect-borne diseases, as well as painful insect bites. List of physicians and phone numbers. Your insurance card or a photo copy of it. Medication with doses. For patients who are concerned about packing prescriptions, Dr. Quinn offers to write a note explaining the patient’s medical needs and medications. Make sure you have enough medicine so you don’t have to get a refill when you are out of town. Take a pill box. It’s helpful to have medicines organized by day and then you only have to pack the amount you will need for the trip. If you’re flying and medicine needs to be refrigerated, just pack a small cooler. Wipes. These are helpful to sanitize the tray table, seat and surrounding area. Hand sanitizer. Remember to pack a small bottle if you’re flying – TSA rules say any liquid must be less than 3.4 ounces! It’s important to wash your hands with soap and water frequently, but hand sanitizer can help kill germs when you don’t have access to a sink. Calming music or a good book. Drink lots of water. Staying hydrated is an important part of keeping your immune system strong. Book the aisle seat if possible. Walk around. “Each time you shift your position is a good reminder it’s time to get up and walk around,” said Dr. Quinn. When you’re crammed into an airplane seat, your body has a harder time pumping blood from your legs back to your heart. Getting up to move around is important for your circulatory system and can help prevent deep vein thrombosis (DVT), blood clots in deep veins inside the body, usually in the lower leg, thigh, or pelvis. Get your flu shot. Everyone 6 months of age and older should get a flu shot, according to the Centers for Disease Control (CDC). It is recommended that people get vaccinated at least two weeks before travel because it takes two weeks for immunity to develop after vaccination. If you are sick with symptoms of influenza-like illness, you should not travel. For international travel, visit the CDC website for additional recommended vaccinations and travel advisories. Planning for a healthy and safe hotel stay starts during the booking process. For extra steps in your day, book a hotel within walking distance of key attractions or take the stairs instead of the elevator. Search for hotels with a gym or pool. Prioritize safety. Make sure the hotel is in a safe area and your hotel door is locked at night. Safety is an important part of overall health. Look for a hotel or restaurant with a breakfast buffet that offers healthy options. Pack your own snacks. Dr. Quinn’s favorite travel snacks are oranges, apples and nuts. Hit the grocery store. Not only is this usually healthier than eating out, it’s also more affordable. Inform the airline of any allergies you have before you travel. Restaurant portion sizes can be larger than what we eat on a day-to-day basis. You can always split a plate or ask the restaurant to bring half of your meal to the table and to box the other half. People with unique medical conditions should talk to their physician about how to manage dietary needs while on the go. For example, if you have high blood pressure, Dr. Quinn recommends asking for vegetables without added sauces and eliminating extra salt. Most importantly – don’t stress! Eating for nutrition and pleasure are equally important. A big part of travel is experiencing fresh cuisines and making new memories along the way. Bon appetit! If you have concerns about staying healthy while traveling, talk to your primary care physician. To find a doctor near you, visit baptistjax.com/bpc or call 904.202.4YOU.